OCBC CARDS WITH APPLE PAY. Enjoy all the benefits of your OCBC Cards using Apple Pay, the easy, secure and private way to pay. Don’t have an OCBC Card yet? Click here to apply. Apple, the Apple logo, and iPhone are trademarks of Apple Inc. registered in the U.S. and other countries. Apple Pay and Touch ID are trademarks of Apple Inc. All other third party company, product, and service names mentioned herein are marks, trademarks, registered trademarks or service marks of the respective owners. 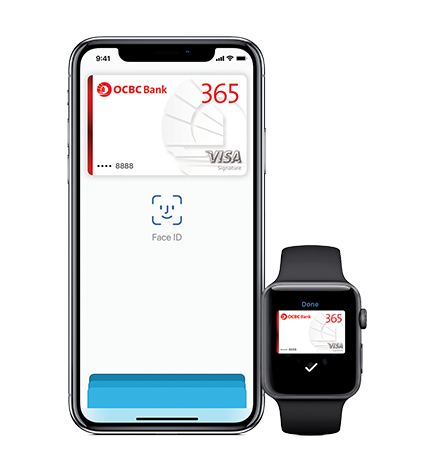 Select your OCBC VISA card and tap on "Add to Apple Wallet"
Hold iPhone near the contactless reader with your finger on Touch ID. Double-click the side button and hold the display of your Apple Watch up to the contactless reader. Select Apple Pay as the payment method and place your finger on Touch ID. Pay with OCBC Cards on Apple Pay at over 300 outlets island-wide and enjoy exclusive privileges! Tap & goTM for your bus and train rides with your OCBC Mastercard® on Apple Pay. On Apple Watch, open the Apple Watch app on your iPhone and select "Wallet & Apple Pay," then tap "Add Credit or Debit Card." From there, follow the onscreen instructions. On iPad, go into Settings, open "Wallet & Apple Pay," and select "Add Credit or Debit Card." From there, follow the onscreen instructions.